This week I discovered the House-Mouse and Friends Monday Challenge Blog. 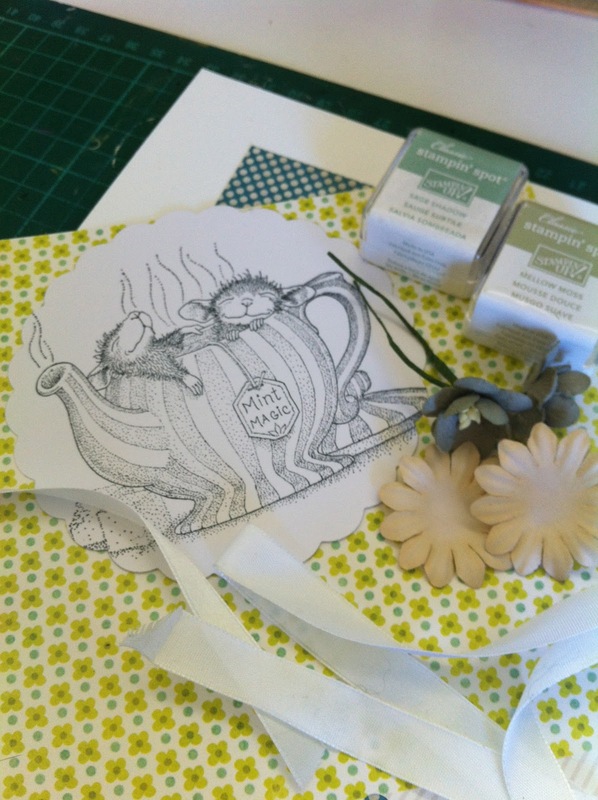 This weeks Challenge is Anything Goes with an optional Tea theme. 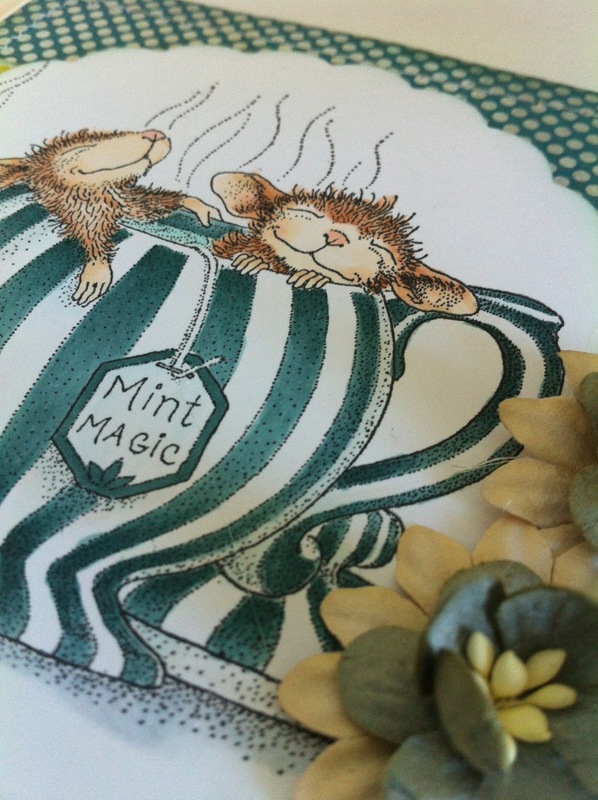 I have so many House Mouse stamps and one of my favourites We're "Mint Tea" be together is just perfect for this challenge. All papers and embellishments are from my scrap pile this week. The ink I have used to distress my papers is Stampin Spot Sage Shadow from Stampin' Up. Such cute little mice! The ladybug is a brad from Around The Block. I got a bit adventurous and even pulled out the sewing machine for this card. Think I need a bit more practice. Does anyone else have a sewing machine that is only ever used for paper! Hi Shell so glad you found our chall blog..this is one stunning HM début creation beautiful colouring love the image & your gorgeous design sets it off perfectly. Thanks for sharing with us at HM & friends chall this wk hope to see you soon?? new chall starts Mon..
Hi Shell that' is such a beautiful card. Love it. Beautiful card and such a lovely colouring of your sweet image. Thanks for joining our challenge at HM&FMC and good luck. Hope to see you again. Love your Mint Magic green theme! And yes, unless forced to mend, my sewing machine only works on paper LOL! 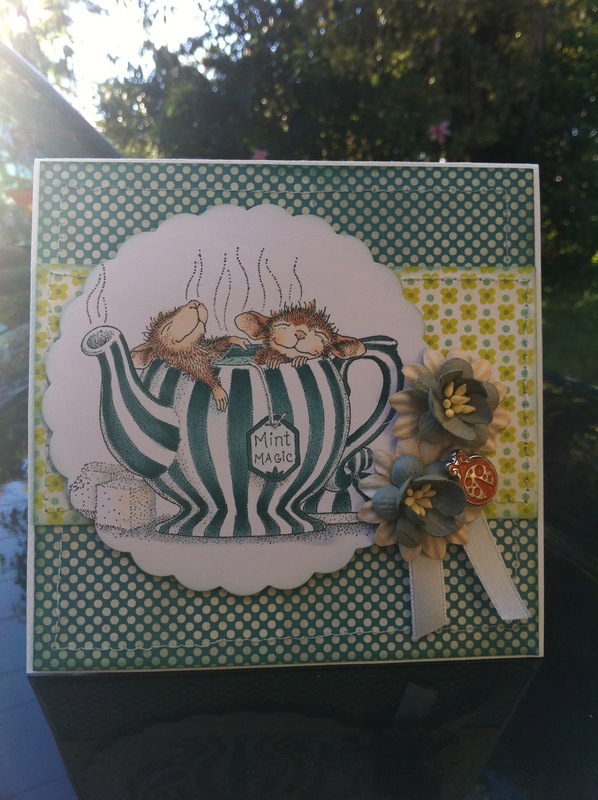 Hope you will join in tomorrow for our House Mouse and Friends Monday Challenge!